Single phase multiferroics are materials which possess two or more ferroic properties due to simultaneous ordering of charge, spin and/or orbital degrees of freedom. The coupled magnetic and electric polarization order in magnetoelectric multiferroics makes them promising for applications in information technology. Besides static magnetoelectric phenomena emerging in the ground state of multiferroics, the entanglement between spins and electric polarization is also manifested in their low-energy excitations. These unconventional elementary excitations — called electromagnons — respond to both the electric and magnetic component of light and generate strong optical magnetoelectric effect at GHz-THz frequencies. 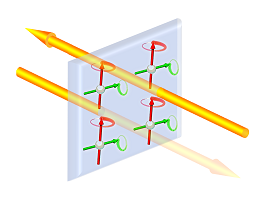 In materials with sufficiently low symmetry1 the interference of these two processes (electric and magnetic excitation) can yield to a difference in light absorption for counter-propagating beams termed as directional dichroism. The effect can reach the order of unity as we have recently observed in the spin-wave excitation spectrum of multiferroic Ba2CoGe2O72. The transparent and absorbing directions are parallel and antiparallel to the cross product of the electric polarization and magnetization — termed as toroidal moment— of the material. Chirality of molecules or crystals is usually a consequence of the spatial distribution of the constituent atoms and can be detected as circular birefringence/dichroism in the energy range of their electronic or vibrational excitations. In contrast, in magnetic materials with achiral crystal structure the ordering of magnetic moments can induce chirality by breaking all mirror-plane and rotary-inversion symmetries of the crystal structure. We found that spin excitations in multiferroic Ba2CoGe2O7 induce huge rotation of light polarization proving the concept of magnetically induced chirality3. Chiral materials can also distinguish between counter-propagating light beams when placed in external magnetic fields. The difference in the absorption for light beams propagating parallel and antiparallel to the magnetic field is called magneto-chiral dichroism. 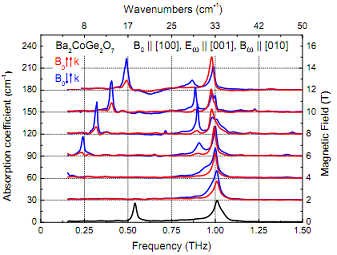 We found that this weak effect is strongly enhanced at the electromagnon excitations of multiferroic Ba2CoGe2O73 and Ca2CoSi2O7, since both their magnetism and chirality originates from the spin order. Owing to these peculiar optical properties, we anticipate that multiferroics will find broad applications in photonics such as directional light switches, circulators and polarization rotators. This research was supported by the European Union and the State of Hungary, co-financed by the European Social Fund in the framework of TÁMOP-4.2.4.A/ 2-11/1-2012-0001 ‘National Excellence Program’.